Inside the building, owner Royal Larocque and longtime employee Teresa Mallette explained that they are always looking for good people. Since Larocque opened his slaughterhouse in 2003, he’s struggled to find enough qualified, reliable workers. The bar is not unreasonably high. “We need people who are willing to show up every day and want to work,” Larocque said. 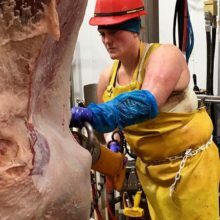 Lorentz Take: Our sister company Vermont Packinghouse is highlighted in this article for moving closer to a closed gender gap in meat processing. Here at Lorentz, while we do continue to be majority male, women are well represented throughout the company–including our slaughter floor supervisor.